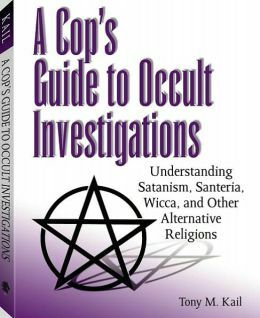 A Cop’s Guide to Occult Investigations: Understanding Satanism, Santeria, Wicca, and Other Alternative Religions was published in 2003, so some parts of it are getting a little dated, most notably its discussion of the internet. It also makes a very big deal of the role playing game Vampire: The Masquerade, which was far more saturated into youth culture in the 1990s than it is today. The parts of the book dealing with actual religions are fairly timeless, however. It is still the best reference book aimed at law enforcement officers that I have yet seen, although I could wish for fairer treatment of my own path, Asatru, which is lumped in with vampire cults in the Miscellaneous chapter and which opens with a broad condemnation of Asatru as racist, although the chapter goes on to note three distinct groups within Asatru, only the smallest of which is connected to racism and crime. Despite my disappointment with this book’s attitude toward my religion, it still managed to get about 80%-90% of the details about Asatru correct, which is pretty good for a general overview book written by an outsider who is the director of the Center for the Study of Deviant Movements and whose purpose in writing the book was to guide police investigations. In the introduction, the author is careful to point out that law enforcement officers who actively discriminate against a religion simply because they personally don’t like that religion may actually be breaking the law themselves, and police should be careful and respectful in their interactions with the public. Since this book was written and published in the United States, that particular caution may not apply to everyone who reads the book. The United States puts religious freedom first in its very first article in the list of rights in its Constitution, along with freedom of speech and the press. However, law officers from countries that have state religions or which don’t recognize all the religions written about in the guide will still find a lot of valuable information in this book. There are chapters on Wicca, Santeria, Palo Mayombe, Voodoo, Other Voudon Religions, Satanism, Juvenile Occult Groups, Miscellaneous Groups, Cults, Special Issues, and Investigations. The chapters on specific religions include information on the deities and their symbols, rituals, ritual objects, priests and temples, and magic. The Special Issues chapter talks about gangs, drugs, serial killers, and other law enforcement related issues. The Investigations chapter discusses how to conduct a police investigation in which officers must investigate a ritual site and / or interview members of the religion. There is a reference guide covering magical objects including gems, incense, oils, herbs, and candles. The Cop’s Guide to Occult Investigations necessarily focuses on crime, and includes examples of specific criminal investigations in which officers had to understand the religions of the criminals and / or the victims to fully understand what they were investigating. There is also a practice exercise for officers to do a mock investigation to review what they’ve learned in the book, and there is a photo guide to identifying ritual tools. While today it is a little offensive to refer to religions like Wicca as “occult,” the book’s title is more an artifact of its time than an indication that the contents are not taken seriously. Guardedly, I recommend this book, until something better and more up to date comes along.